My Summer project this year is to expand my repertoire of stitch patterns. I have several stitch pattern books and started with the Tile 1 pattern in the 400 knitting stitches book by Potter Craft. This pattern is a 14 stitch repeat. 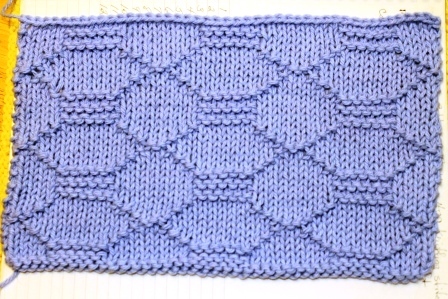 My swatch is 3 repeats of the pattern along with an edge stitch on each side. It measures approximately 11 inches wide. I repeated the 12 row stitch pattern 3 times. It measures 6 1/2 inches long. I’ve set up a notebook and I’m going to create a collection of my favorite stitch patterns so that when I’m ready to create, I have a personal reference resource. This idea came about as a result of my recent class with Knitwear designer Deborah Newton. She stressed the idea of making swatches just for the fun of it. She had a whole collection of large, beautiful swatches and I was inspired.